Technically we’re still in our Upside Down Life series. 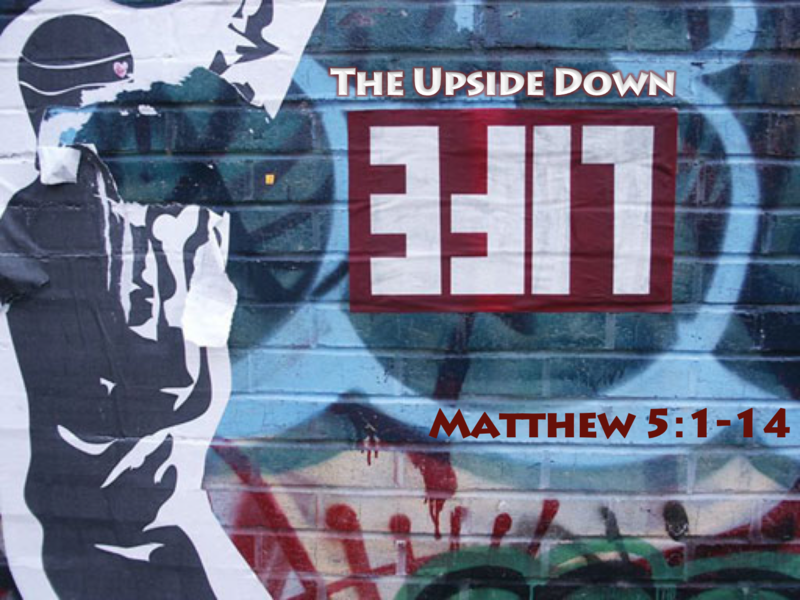 This is week #9 of the series and week #C looking at Matt 5:6: “Blessed are those who hunger and thirst for righteousness, for they shall be satisfied.” If you missed those the notes can be found below. Last week I began to zero-in on the word righteousness in Matt 5:6 and, first of all, we noted that it is a hunger and thirst for God’s righteousness – not our own. We also said that God’s righteousness is part of a larger theological concept (or construct) called the Doctrine of Justification. The Doctrine of Justification can be compared to a two-sided coin. Here’s the BIG IDEA for today: A lot of church-goers have not understood both sides of the “justification coin.” We tend to think of justification mainly in terms of God’s forgiveness. Today I’d like to dig a little deeper into the “imputed righteousness” side of the justification coin found in Roms 3. We will be looking at Roms 3:21-28. This material this been informed largely by the teaching of Tim Keller and Wayne Grudum. The section of Scripture that really unpacks the concepts of Free Justification and Imputed righteousness are found in Roms 3:21-5:21. We will be looking at the first eight verses of that section. Why do we need free justification? How do we get free justification? 1. Why do we need free justification? We all want to know that our life counts — we all long to feel worthy, accepted, and validated. Justification is an integral piece of our (humankind’s) search for meaning. Generally speaking men look search for our justification in WHAT WE DO and (generally speaking) women search for justification through their RELATIONSHIPS. The old sermon illustration related to Roms 2 and Matt 7:2 – God places a little invisible recorder around the neck – only picks up what we tell other people about how they should live. Then God hits the “PLAY” button…No one will be able to stand on Judgment Day. None of us can justify our existence – even by our own standards. Everyone on the planet is struggling for justification and nobody is getting there. Paul says — There’s a solution (“But now”)…It is possible through the gospel to end our struggle for righteousness validation, for worth, and for acceptability. The solution is: free justification. 2. How do we get justification? Last week we defined righteousness is a validating performance record, which opens doors. We tend to believe it’s the same with God – that we are to, somehow, build a validating moral performance record to make it into heaven. Jesus comes along, and with the other NT writers, tells us about an absolutely unheard of spirituality, an unimaginable approach to God. Where God provides us with an unblemished record—absolutely free of charge. Not just a good record, or even a great record – but a divine righteousness – a perfect record that comes to us, alights upon us — as a gift! When we have it it’s the end of our personal struggle for validation, for worth, or worthiness, and acceptability. The gospel is that God develops a perfect righteousness and provides it to us – and by THAT righteousness alone we are accepted. Free justification is important because it affects our assurance of salvation. Last week we considered the difference between IMPARTED (or, INFUSED) righteousness and IMPUTED righteousness. Many churches – including the Catholic Church teach IMPARTED (or, INFUSED) righteousness. A. So, what IS Imparted (or Infused) Righteousness? Paul is not writing that we are transformed into people who possess righteousness, but rather that we have been united to Christ. False gospel: A pastor tweeted — “Once you believe that you are righteous, you will begin do what is righteous.” (Creflo Dollar). This pastor does NOT understand the gospel. B. Imputed Righteousness – The word “impute” means “ascribe” or “credit.” Imputed righteousness carries the theological weight of being “counted” or “considered” or “reckoned” righteous. Paul is not writing that we are transformed into people who possess righteousness, but rather that we have been united to Christ (i.e., the 30 “in Him” passages of Paul’s letters), and are found, “in Him” — because of our union with Him (the emphasis of Romans 5), we have that which He possesses, that is, righteousness. One the one hand free justification is far more than forgiveness and pardon – but on the other hand it is distinctly different than moral goodness. The righteousness of God comes TO us – it is the righteousness of Christ – which is a PERFECT performance record. Jesus lived the life we should have lived and died the death we should have died – and we get the full benefit of that. 3. How do we get it? People understand that if they confess their sins and acknowledge that Jesus Christ died for their sins they get forgiven – “And now,” they say, “I really need to live for Him.” This is a moralistic view of the gospel – yet this is how a lot of church-goers think. So people end up cycling in and out of the church – come in as kids and cycle out as teenagers…then something goes wrong in their lives and they cycle back into the church. They try hard to live like they should – and then something goes wrong or they fall, or fail and fade away until the next time they see the need for Jesus and church. They come back in and ask for forgiveness and they re-commit – and then they try to live a moral life – but they end up failing AGAIN! They never get to what we’re talking about today – free justification. They actually never become Christians. Because a Christian is someone who is justified freely by faith through the blood of Jesus Christ. It’s grace alone, through faith alone, through the finished work of Christ alone. Here’s what’s necessary: We need to get our primary focus off our sin addiction and begin to boast, not in our moral performance record (or lack thereof), and boast in the finished work of Christ – which grants us free justification. What makes us a Christian is to not just to repent of our sins — but to repent of our false righteousness and false justification as well. It’s a transfer of your moral record to what Jesus has done. “Just-as-if-I’d-never-sinned” is actually a very shallow and incomplete definition of justification, mostly because it only speaks to one side of the coin. It is God who awakens belief in our hearts. Col 2:13: When you were dead in your sins and in the uncircumcision of your sinful nature, God made you alive with Christ. He forgave us all our sins. Paul often uses the word “cross” as a one-word summary for The Christ Event (i.e., the birth, ministry, death, resurrection, and ascension of Jesus). Sir Marcus Loane (d. 2009, formerly Anglican Archbishop of the Diocese of Sydney), quoted in John Stott’s, The Message of Romans, InterVarsity Press 1994: 110.